The University of Maryland released details today of the most extensive full face transplant completed to date, including both jaws, teeth, and tongue. The 36-hour operation occurred on March 19-20, 2012 at the R Adams Cowley Shock Trauma Center at the University of Maryland Medical Center and involved a multi-disciplinary team of faculty physicians from the University of Maryland School of Medicine and a team of over 150 nurses and professional staff. The face transplant, formally called a vascularized composite allograft (VCA), was part of a 72-hour marathon of transplant activity at one of the busiest transplant centers in the world. The family of one anonymous donor generously donated his face and also saved five other lives through the heroic gift of organ donation. Four of these transplants took place over the course of two days at the University of Maryland Medical Center. The face transplant team was led by Eduardo D. Rodriguez, M.D., D.D.S., associate professor of surgery at the University of Maryland School of Medicine and chief of plastic, reconstructive and maxillofacial surgery at the R Adams Cowley Shock Trauma Center at the University of Maryland Medical Center. Dr. Rodriguez is board-certified in plastic and reconstructive surgery as well as in oral and maxillofacial surgery. This marks the first time in the world that a full face transplant was performed by a team of plastic and reconstructive surgeons with specialized training and expertise in craniofacial surgery and reconstructive microsurgery. 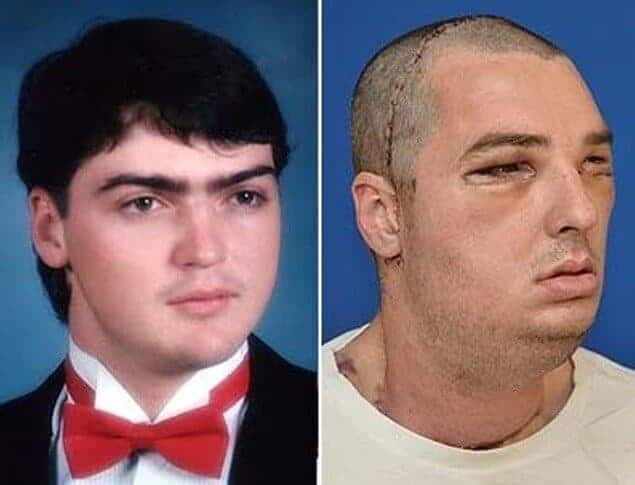 The face transplant recipient, 37-year-old Richard Lee Norris of Hillsville, Virginia, was injured in 1997 in a gun accident. Since that time, he has undergone multiple life-saving and reconstructive surgeries. Due to the accident, Mr. Norris lost his lips and nose and had limited movement of his mouth. Mr. Norris first came to the University of Maryland Medical Center in 2005 to discuss reconstructive options with Dr. Rodriguez. Grant funding from the Office of Naval Research (ONR) in the Department of Defense to Dr. Stephen Bartlett has supported the University of Maryland basic and clinical research program in vascularized composite transplantation leading up to and supporting this groundbreaking face transplant. The ONR funds medical research to support military operational medicine and clinical care of returning veterans. In addition to conducting research, the University of Maryland supports military medicine in a variety of ways, including training military medical staff prior to deployment and performing organ transplant surgeries for patients at Walter Reed/Bethesda National Naval Medical Center. “The future of medicine depends on rapid translation of research and creating high-performing teams. The face transplant is a perfect example of the life-changing options we can provide for our patients when we combine the expertise of our research and clinical teams to pursue procedures that would have seemed unfathomable not so long ago,” says E. Albert Reece, M.D., Ph.D., M.B.A., vice president of medical affairs at the University of Maryland and dean of the University of Maryland School of Medicine. The team of face transplant surgeons benefited greatly from their experience treating high-velocity ballistic facial injuries at the R Adams Cowley Shock Trauma Center at the University of Maryland Medical Center. The team also includes research scientists and physician scientists from the University of Maryland’s nationally recognized Division of Transplantation who have been researching ways to reduce rejection of donated organs and minimize the side effects of long-term immunosuppressive use after transplantation. The scientific team that includes Drs. Stephen Bartlett, Rolf Barth, and Eduardo Rodriguez focused on the anatomic and immunologic challenges to craniofacial transplantation. This work has been the basis for Dr. Rodriguez and his surgical team’s groundbreaking surgical achievement. The face transplant team collaborated with the Living Legacy Foundation of Maryland, the organ and tissue donation program serving most of Maryland. The Living Legacy Foundation of Maryland is a non-profit organization that helps facilitate the donation and recovery of human organs and tissues for transplantation and research, and provides public and professional education on organ donation. The University of Maryland Medical Center (UMMC) is a 779-bed teaching hospital in Baltimore and the flagship institution of the 12-hospital University of Maryland Medical System. Patients are referred nationally and regionally for advanced medical, surgical and critical care. All physicians on staff at the Medical Center are faculty physicians of the University of Maryland School of Medicine.